Maguire Fuels in Belleek, County Fermanagh is celebrating its 20th anniversary this year. We met up with Colin Maguire to look back on the history of this excellent family business and to explore the comprehensive range of products and services provided. Based in Belleek, County Fermanagh, Maguire Fuels is a family-run business offering a comprehensive fuel supply service. With 20 years’ experience in the industry, they have the capacity and wherewithal to provide a prompt fuel delivery service at a very competitive price. The business was established in 1994 by Peter Maguire, originally to distribute home heating oil and red diesel to customers in Belleek, Garrison, Belcoo and the surrounding areas. In 2008, Peter’s son Colin joined the company and initiated the coal and gas division of the family business. Maguire Fuels provide a solution to all heating needs, whether for domestic, commercial or agricultural use. A friendly, fast and efficient service is provided six days per week and the range of oil, coal and gas is supplied at keen rates, with services available including same-day deliveries of fuel (no order is considered too big or too small!) as well as oil tank replacements, emergency call-outs, oil suction and transfer and a Cash & Carry service. All major payment methods are accepted, including cash, cheque, credit and debit cards, direct debits and Paypoint. The comprehensive range of fuel products supplied includes kerosene home heating oil; red diesel agricultural fuel; a range of house coals, smokeless fuels, peat briquettes and kindling; logs, turf and firelighters; fire grates and fireside accessories; and both butane and propane gas for cooking and heating. Gas cylinders are available in a range of sizes and can be either collected at Maguire Fuels’ depot or can be delivered to a customer’s doorstep. Throughout its two decades of existence so far, Maguire Fuels has complemented its vast range of products with a level of customer service that is second to none. This is why they are the No.1 port of call for all fuel requirements in beautiful Belleek and its environs. Fleet-wise, the Maguires operate two tankers, 7.5 tonne and 13 tonne: one ’07 DAF and one ’08 DAF, one with a 7,000-litre tanker and the other boasting a 5,000-litre tanker. These are complemented by two Toyota Dyna coal delivery trucks. “I spotted a market for coal delivery and started that service six years ago. It has expanded every year since,” Colin states. “We’ve had two new paint jobs done this summer and changed the whole brand with the inclusion of professional images and logos. 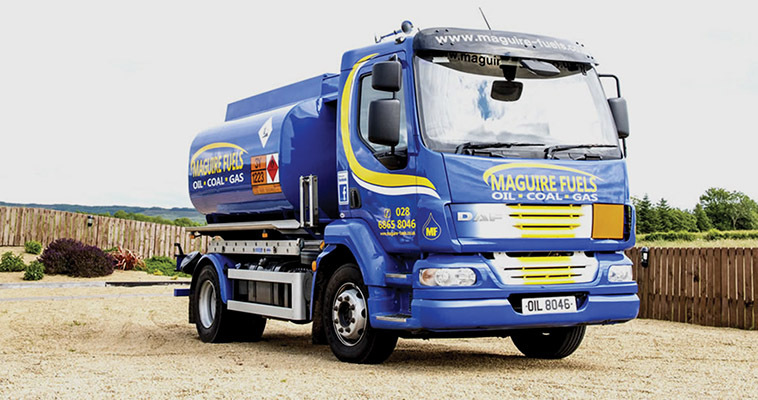 We believe that the more professional image will make the right impression and this is very important.” The vehicles look fantastic and certainly play their part in promoting the Maguire Fuels name. “Our main supplier is Beatty Fuels in Ballinamallard, with whom we enjoy a very good long-term relationship. We’re hoping to continue that well into the future,” Colin adds. All in all, Colin is happy with the current status of the family operation: “It’s steady at the minute,” he confirms. “We’re going well and we are looking forward to whatever the market brings. We have two owner-drivers and we always meet customers face-to-face and never let anybody down, which is vital This is a family-run business and we would be well-known in the area. Tellingly, there are no plans to expand the business or to get out of their comfort zone. To the contrary, the plan is to look after the existing customer base. "We’d rather keep it local and do it right,” says Colin. “We’d like to look after the locals and that’s what we’ll focus on. As they say, small is beautiful. “We’re busy all year around. During the summer, the farming side picks up and things tend to even themselves out. Agriculture is an important part of the local economy and also of our business. This has been the case for 20 years and, one suspects, will continue to be the way with Maguire Fuels for many more years to come.